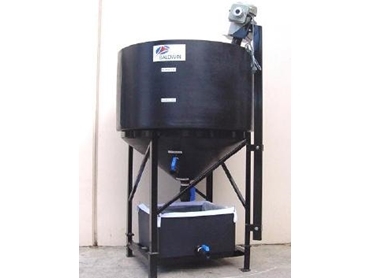 The Busta waste water treatment units from Baldwin Industrial Systems have been designed to remove (and fully encapsulate) suspended solids, oils and greases, heavy metals, surfactants, etc. These units can clean three to four batches of 300 litres per day. One of the Busta waste water treatment units was installed in a paint manufacturing facility that needed to improve the quality of their wash water prior to discharging to the sewer system. Contaminated wastewater was being generated in this each time a vat or tank is washed out – usually when changing product blending, generating approximately 100 to 500 litres per day. Tougher discharge limits to sewer, increasing trade waste charges and high disposal costs let this painting business to a decision to treat the wastewater on site. The ideal solution came in the form of a Busta waste water treatment unit. These economical, manual treatment units dry sludge produced by the addition and mixing of RM-10 clay based chemicals, can be disposed of direct into the rubbish skip and the clean water can be discharged direct to sewers. These waste water treatment units provided the owners of this paint manufacturing facility considerable savings in time and disposal costs.